Standing on foundations built in 966, Schönburg is one of the best preserved of all the Rhine castles. In 1166 Emperor Barbarossa of the Holy Roman Empire took possession of the castle and granted it to one of his men. The Schönburg family had a famous member in its midst: Frederick became a general in the army under English king William III, who bestowed him with the title of duke and peer of England and grandee of Portugal. Schönburg castle was put to the torch by the French in 1689, and the family died out 30 years later. Schönburg has been on my top ten castle hotel list for years. 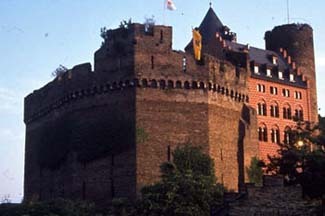 If you have just one castle hotel along the Rhine in which to sleep, this is that special choice. If rooms are full, come for a meal at least and dream about a return trip. Rates include 4-course dinner, breakfast, tax, and service. Oberwesel lies along the most picturesque part of the Rhine River. Rhine boats stop at the town and trains along the Koblenz-Bingen line as well. A footpath leads from town up to the hotel, as well as a road, (which is a long hike on foot). Yes. There is a chapel on site. Schönburg is a splendid combination of rugged castle and exquisite hotel accommodations that incorporate medieval architecture with modern comfort. Overlooking and dominating the little town of Oberwesel, the reconstructed medieval towers and ramparts command excellent views up and down the Rhine River. Within the massive wall surrounding Schönburg are three interconnected fortresses that are a delight to explore. Hidden rooms, winding stairways, narrow corridors, and lead-paned windows with glimpses of the river are all part of the fun. For quiet relaxation, cozy up with a book in the castle’s library in front of an open fire. A great knights’ hall holds a highly regarded restaurant. More often than not, when you book your accommodations at the castle, the rates will also include dinner. Check beforehand. Guestrooms are configured according to the castle architecture. Many have window seats and balconies with views of either the vineyards or the river; exceedingly romantic is a bedroom in a turret. All are beautifully decorated.